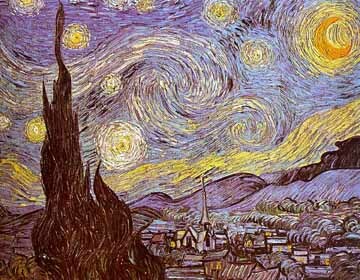 Vincent van Gogh's "Starry Night," which we used as a model for oil pastel drawings, following an Art Masters presentation. The children did a beautiful job of making mark after mark and building spirals around their points of light, working concentratedly for a longer period of time than is usally admitted 5- and 6-year olds can do: an hour. I'm very proud of the accomplishments of this particular class, not only in the art we display here but in their language development (14 of 20 were designated Non-English Speaking, yet everything we did, we did in English only, and did it well) and solid understanding of math concepts. While we were studying Monet's and van Gogh's brushstrokes, we learned that our eyes can blend two colors into another. Red next to yellow makes orange when you stand back from the picture. We made magic color changers to spin red, yellow, and blue into orange, green, and purple when our eyes do the mixing! This page is created and maintained © byAlison McMahon Johnson. Last updated 3 May 1999. This is a part of the personal teaching homepages of Mrs. Johnson, aka: the fabulous Alison McMahon, Artist Extraordinaire. Statements on these pages are those of the author and not of the district or the school.